In Italian with English subtitles. This film's title translates to "The New Monsters" and is also known as "Vivia Italia!" 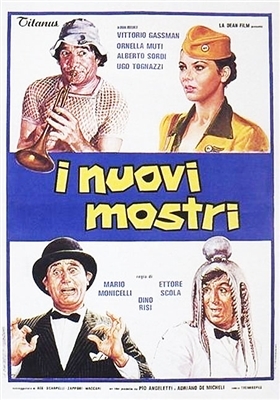 This is 90-minute American cut of the film, which presents a series of vignettes depicting everyday Italian life in the mid-70's. The vignettes included here are: Tantum Ergo, Con i Saluti degli Amici (Greetings from Friends), Autostop (Hitchhiking), Pronto Soccorso (First Aid), Hostaria! (Restaurant! ), L'uccellino della Val Padana (The Songbird of Val Padana), Come una Regina (Like a Queen), Senza Parole (Without Words), Elogio Funebre (The Eulogy).